I think I'm having trouble coming to terms with the fast approaching end of summer. I was talking with my friend Jodi about how we're always happiest right before something great happens. I think that may have subconsciously been the inspiration for this dish. In some way I'm trying to get back to spring when the farmers markets are starting to fill with a huge variety of produce and you know summer is on its way with all the BBQs, homegrown tomatoes and late, warm evenings that come with it. So, I bring you spring. A petite pea risotto with a hint of tarragon. Enjoy and join me as we lament the passing of summer! Bring the chicken stock to a boil on the stove and leave simmering. Heat the oil over low heat in a medium pot and stir in the rice to coat. Add 1 cup of chicken stock to the rice and stir. Stir frequently until the stock is almost absorbed and then add more. I don't measure as I pour, just pick up the pot of stock and pour a bit in at a time until the wonderful, creamy risotto texture comes out. You'll know you're there when the rice stops taking stock. Add peas and stir until heated through. Remove from heat and stir in tarragon, salt and parmesan. 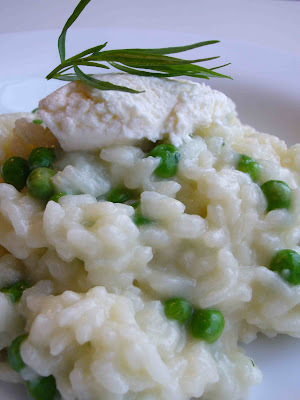 Divide risotto between two plates and top with a dollop of ricotta and a tarragon sprig if desired. Enjoy! I'm a big peas fan. And it's one of the only green veggies my kiddo will eat. It's tough for me to pass risotto off as a main dish for my hubby, but I might be able to pass this off as a nice side dish! Hi recipegirl - believe it or not, the boyfriend actually ate it as his main course last night. He must not have been too hungry, but I was still impressed. Michele - thanks for the compliment and for sharing the story. I love the nostalgia that can be created around food! I love peas and risotto so this looks really delicious!